Weeknights are reserved for easy to prepare dinners featuring fresh, good for you foods. 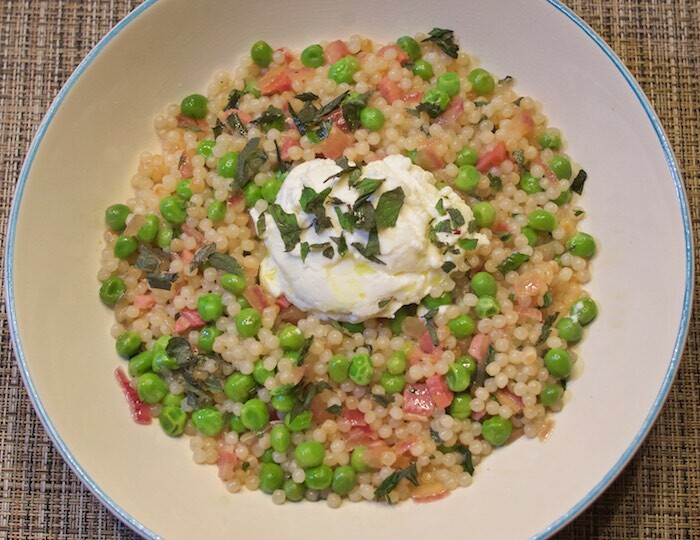 The recipe below features Israeli couscous topped with a medley of my favorite summertime flavors. It's so delicious and satisfying even the most finicky eaters will love it. Heat olive oil in a large skillet over medium and cook pancetta about 2 minutes, stirring often. Add onion and cook, stirring occasionally, until translucent, about 5 minutes. Add wine, bring to a simmer, and cook until skillet is almost dry, about 5 minutes. Taste and season with salt and pepper. Add peas and chopped mint and cook, stirring, until peas are warmed through, about 2 minutes. Add cooked couscous and mix together. Serve topped with ricotta. This sounds delicious. I love mint with peas, such a yummy flavor combo. This looks so amazing! I love israeli couscous! I love couscous dishes! Such a fun meal idea! Couscous is the best and I don't make it nearly enough! This looks so delicious, the summer flavors are wonderful! Always wanted to try adding mint into savory dishes. I've never tried mint with peas before! This looks yummy I would totally throw it over a bed of salad and call it dinner!